Satellite broadband is an option available for those who live in rural areas where traditional fixed-line based broadband services aren't available. It uses a satellite dish to provide two-way access to broadband services but speeds which used to be lower have improved with download speeds of up to 30 Mbps available. The main advantage of satellite broadband is that it can be provided virtually anywhere in the world, so long as you have a clear line of sight to the south generally. It is often seen as an option to fill in broadband coverage in hard to reach areas (like the final few percent of the country which is unlikely to receive next-generation fibre broadband) but for many, it doesn't provide a comparable service to fixed broadband products due to the increased latency. Services available vary but generally offer speeds from 2Mbps up to around 30Mbps. Upload speeds used to be lower (128 / 256 Kbps) but following the launch of new Ka-band satellites, these have increased with options for up to 6Mbps upstream speeds. Costs for satellite broadband vary between around £30 per month up to £100+ depending on the amount of data you want to use. The usage allowances while better than the equivalent mobile broadband package are still lower than most fixed line broadband solutions, but unlimited products are available. This makes satellite broadband less suitable for heavy use such as downloading large files or catching up on TV through BBC iPlayer. Installation will require special hardware including a satellite dish and modem to be installed. These can often be installed by the user but start at a few hundred pounds, plus an install fee if you want installer to set-up the dish. One problem often associated with satellite broadband is the high-latency that is encountered which is caused by the long distances (up to a satellite in geo-stationary orbit) that the broadband signal has to travel. People may be familiar with making phone calls to the other side of the world, and there being a delay of around a second. This high latency also seen on satellite broadband means that can limit the use of many real-time applications which are often seen as one of the benefits of a broadband connection. First person shooter games are not feasible, but while video conferencing and VoIP will work so long as you allow for the extra lag. 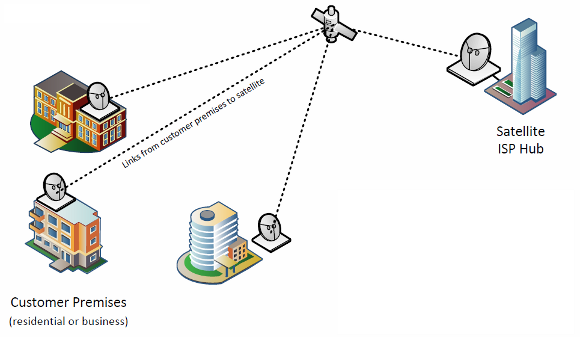 In figures two way satellite broadband has a latency of 800ms or higher compared to the 10 to 20ms on a VDSL2 service. Satellite broadband can be affected by the weather. It requires line of sight between the dish and the satellite orbiting above earth, and anything that gets in the way of this, such as moisture in rain, can cause errors on the link. Although a general rain shower shouldn't affect things, a large storm could cause disruption to your broadband link. There are various providers who offer satellite broadband services, but many resell those of a couple of existing satellite operators, Astra2Connect, Avanti or Tooway from Eutelsat. Details of some of the options available are listed below. If you are in an area with sub 2 Mbps as the only fixed line option then check whether any vouchers are available, you can check using the thinkbroadband coverage checker or most satellite operators will be able to advise. * Unlimited but slowdown applies as you use more data. # Unlimited between 11pm and 7am. ^ Traffic management policy applies. ## Unlimited between midnight and 6am.